Panama gave me a lot of mixed feelings when I arrived, especially after traveling together with M. for a while. First of all, this is the last country on my ‘to-visit-on-this-trip-list’, which means: the end is near. Second, I didn’t know what to expect or where to go besides some suggestions of other people on the road. And last, I was so busy looking forward to Cuba – yes, blogpost coming soon – that I didn’t realize I was supposed to spend my two last weeks in another country. Result: the first few days I was rather sad and more on my own, going into rehab from traveling together to traveling alone again. Luckily, that feeling changed quickly in Bocas del Toro. I hadn’t seen much of the Carribean coast yet – besides Cuba, again, see next blogpost – so I arrived there with expectations of long white sand beaches dotted with palm trees, clear blue water where you can see fish and coral as if you’re looking through a window, coconuts and mucho sol. – this is ‘sun’ for the non-Spanish speakers – And I wasn’t disappointed. My first day I took a little tour, organized by the hostel I was staying at. First stop: isla Zapatilla. As a part of the Isla Bastimentos National Marine park, you find tons and tons of unknown – to me unknown of course – trees, mangroves, plants, birds and other animals. Best of all, you can enjoy as much fresh cocos milk as you can possibly drink – with or without rum –, if you can open those damn nuts. And the beach is pristine, with crystal clear warm water to swim in. Everyday I had the impression I came closer and closer to experiencing paradise. Lunch was eaten in one of the restaurants on the water, a bunch of wooden huts on stilts, hovering over transparent waves carrying loads of fresh fish and starfish. Those fish might have ended as our lunch. I guess that’s life, one moment swimming happily, the other on a plate for a bunch of foreign tourists. Second island to visit: Sloth island. Yes, you read it well, I guess you can guess, there are sloths on the island. However, we didn’t set foot on the island, it’s covered by mangroves – which makes it hard to walk, as in: impossible – and the boa constrictor likes to eat sloths for breakfast. And lunch. And diner. The boat driver navigated our tiny speedboat around the island, looking for sloths. The man had magnificent eye sight, since he spotted a boa – a brown, well camouflaged snake, twisted around a tree. It took the rest of the boat ages to see it, and even then not everybody knew where to look – when speeding past the mangroves. In the end, he found a sloth as well, managed to climb into the tree, grabbed the sloth and dragged – the sloth was happily dangling around his arm – the poor animal to our boat. To be honest, I’ve never seen such a happy animal. Very photogenic, always smiling at the camera, not bothered by the attention at all. And very happy to be released afterwards as well, climbing back into his tree faster than you would expect. After my first encounter with a happy sloth, the boat speeded forward to some reefs and corals to snorkel. Since it was deep and my first attempt to snorkeling, it wasn’t a big personal success. Big waves, rain and deep water made me gasp for breath way too often. I decided to quit and head back to the boat, soon to be followed by the rest of the group. A day as filled as the ‘Sloth day’ deserves a quiet day afterwards – that’s what I think. You don’t have to agree, but you would under the same circumstances: beaches and island. Come on, what’s better than to relax? – and A. 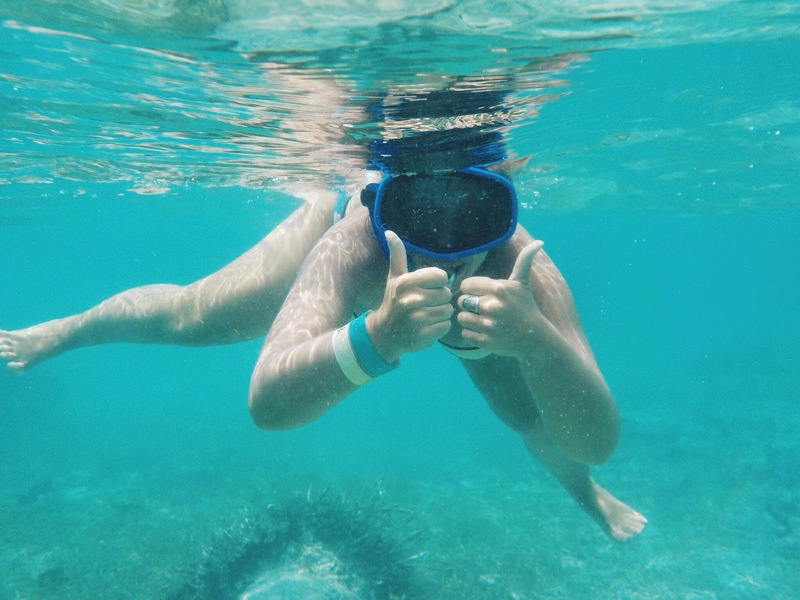 – an Austrian girl who just started her trip and shared two nights of cocktails with me – and I decided to go to Starfish beach, on the other side of Colon island. Where we relaxed, enjoyed the view, swam and read books. Spotted some dolphins in the meantime too. Closer and closer again to paradise. Since I was getting closer and closer to the end of my trip as well, I moved on to Panama City. Last stop on my trip, but I still had a week and a half left. 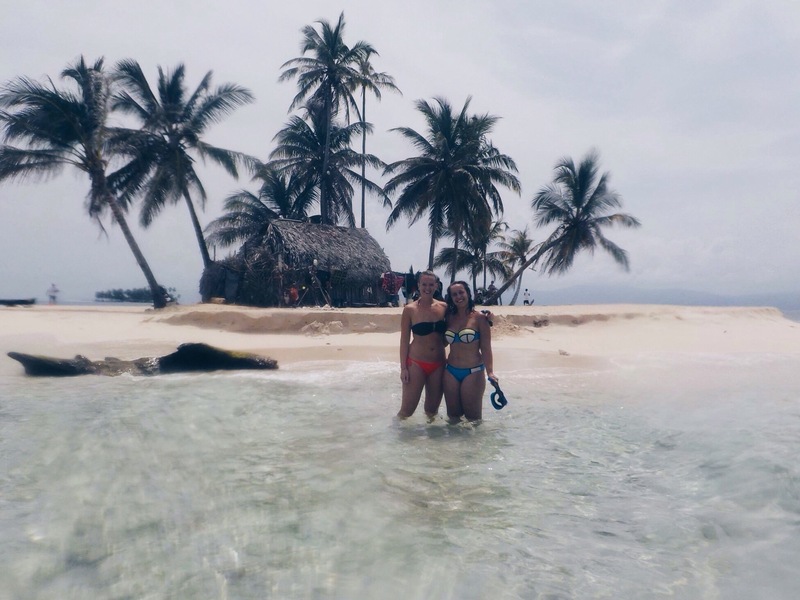 I decided to stay in my hostel – Luna’s Castle, I can recommend it to everybody – for two days and book a trip with Cacique Cruiser to the San Blas islands – yes, I got lazy and didn’t want to figure it out by myself. And they had almost unlimited rum on the tour –, which are four hours away of the Capital. My second day in Panama City, I met R. in the hostel and convinced her to join, both very happy to have good company on the trip. You have to know, the San Blas islands are part of the Guna Yala district, inhabited by indigenous people, the Kuna or Guna Yala. The San Blas islands, a group of 360+ islands, and a part of the mainland is their territory. They exploit and own the islands, you are only a visitor and guest. The Kuna women are known for the beautiful traditional clothes they’re wearing and often sell the ‘mola’ on their island as well. Anyway, to get there, you have to drive with a 4 wheel-drive vehicle on a windy road, going up and down very often, until you reach the ‘harbor’. There you catch the boat to your island. Crystal clear water, white beach, palm trees, hammocks, coconuts and peace and quiet. 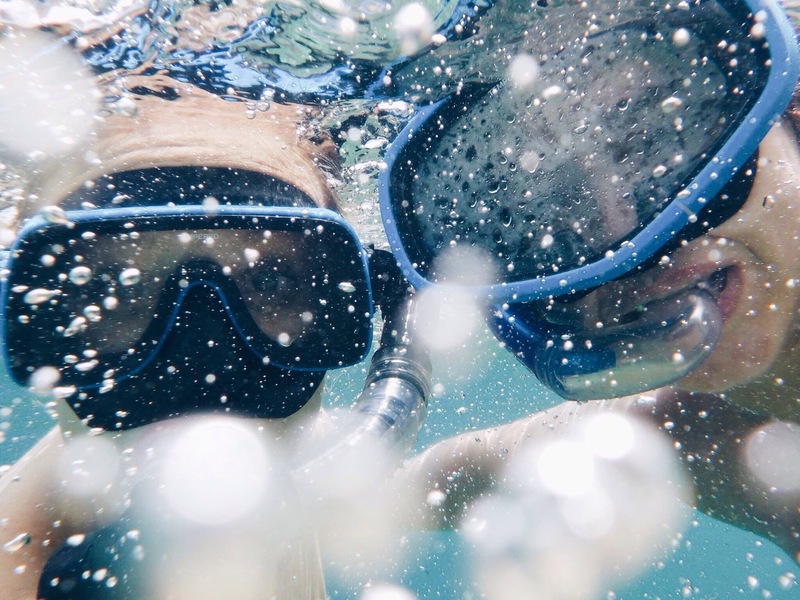 Three days of swimming, snorkeling in surrounding islands – isla Perro with the sunken ship, isla Pelicano with beautiful corals, la piscina natural with the starfish and isla Hierba with a tasteful barbecue –, drinking loads of rum, seeing dolphins playing with the boat and amazing sunsets. I found paradise. R. went back to the capital the second day and left me with C. and B., two lovely girls – I can still call you girls, no? – from Germany. We had a great night together on isla Iguana with B. – our guide – and L. – Kuna – drinking rum and teaching us how to dance and who invited us later to join them to go and watch a Muay Thai Boxing Night, back in Panama City the next evening. Since we had to go back that evening anyway and already spend a great night with them, why not join? I never even saw a boxing game before. I guess I can scratch that one off my bucket list, just like ‘watching-the-best-view-over-Panama-City-from-an-apartment-in-the-middle-of-the-city’. We ended together with a bunch of friends of B. and L. in one of their apartments, with the most magnificent view over the city. I couldn’t be teared away from the terrace, with the skyscrapers and a million tiny lights left, Casco Viejo and the boats waiting to enter the Canal and a million tiny lights right, and a beautiful starry sky right in front of us. The last three days of my stay in Panama City I spent walking around the City, seeing more of Casco Viejo, visiting the Panama Canal and some museums – hurray, two ships from different directions at the same time! – and walking around, being sad because everybody was leaving and I was leaving as well, talking to J., L. and crazy P. at the hostel, drinking rum and enjoying the evenings. As far as I remember. L.’s last night she decided to spend in the Trump Tower – google it – and lucky me, she asked me to join her – since she had a spare bed anyway -. I still have to thank her on my bare knees for that. Not my last but the night before, I fell asleep at 20.30, tired out by one of the softest beds I’ve ever slept in. This only after I enjoyed a swim with L. in the infinity pool and watched the sun disappear in the Pacific Ocean, before a full moon showed up in the sky. Previous PostPura vida in Costa Rica. Next PostTravel back in time to Havana.